Listed below are my 2015 Defensive Tackle Rankings for IDP Redraft Leagues. I will continually update these throughout the off-season to reflect changes in free agency, defensive schemes, playing time, draft selections, etc. 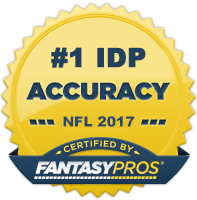 However, keep in mind that the information listed here is just a small sample of a much larger set of rankings and descriptions that are accessible through purchasing my 2015 Fantasy Football Draft Guide. 1. LDT Aaron Donald (STL) - After a slow start to his rookie season, Donald showed everyone why the Rams made him the 13th overall pick. He rattled off seven sacks in his final nine games and finished the year with a respectable 34/10 tackle line. Playing along the league's most talented defensive line should keep Donald free to build on his 2014 numbers. High upside DL2. 4. NT Marcell Dareus (BUF) - Dareus set a career high in sacks last year with nine and has proven to be one of the more productive large-body front men in the league. His 21.7% sack conversation rate (sacks/pressures) is one of the highest in the NFL over the last 8 seasons. The switch to a 3-4, five-technique may have some concerned about his value moving forward, but he's seen success in a similar role before and should see ample pass rushing opportunity under Rex Ryan. 8. DT Clinton McDonald (TB) - McDonald, a seventh round selection back in 2010, has emerged as a relevant fantasy option for owners over the last two seasons. During that time, he's compiled 11 sacks and averaged over 40 total tackles. He's not a high upside option, but he should be a fairly safe middle of the road DT2 player. 9. DT Sen'Derrick Marks (JAX) - Marks led all defensive tackles with 10 sacks last year. He tore his ACL in Week 17 however and may wind up missing the first couple games of the regular season. He should be a solid DT1-/DT2+ upon his return, so if you have a deep bench you can definitely think about grabbing Marks sooner than this ranking suggests. 10. DT Sharrif Floyd (MIN) - Floyd took a big step forward in his sophomore year under new head coach Mike Zimmer. Despite missing two games, he still managed five sacks. It wouldn't be a surprise if he bested that figure in 2015. He's a solid DT2 candidate.